The "Sticky" dropdown in Themes and Plugins sub-forums does not work. 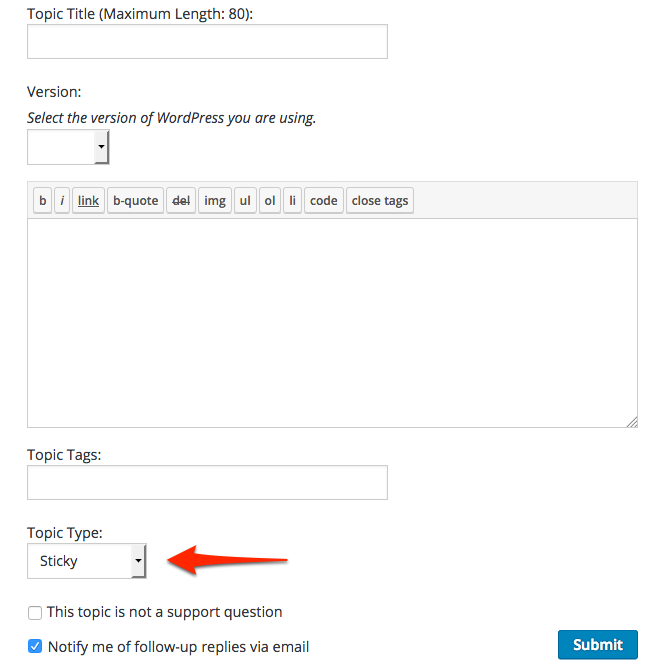 In an individual theme or plugin forum, select the "Sticky" status from the drop-down. Result: The post is not stickied - there is no sticky class and no thumbtack icon. Expected: The post should have the sticky class and icon. 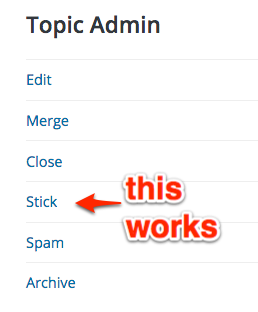 As a workaround, clicking the "Stick" link in the Topic Admin sidebar correctly stickies the thread, adding the pin icon and the sticky class. I tested the "Super sticky" dropdown and it appears to be broken as well. Those are for the support forum moderators to stick topics to whole forums, not for plugin/theme authors. They don't see those options, they only see the stick/unstick hover, which sticks a topic to their plugin/theme view of the forums. To clarify: There are two hidden "forums" where plugin and theme topics are all held together. The "Support" views for plugins and themes are just that, "views" of specific sets of topics in those hidden forums. 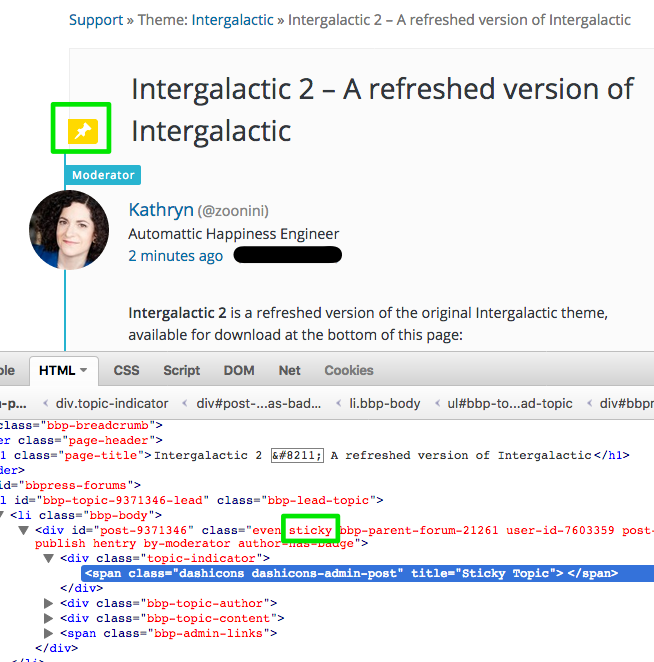 For their view alone, plugin/theme authors can see a "Stick" link on hovering over a topic. That sticks the topic in their specific "view" of their support posts. These two different kinds of stickies are different and so have different links. Only moderators/admins should be able to see the Topic Admin and/or Sticky dropdown. Authors should not. Given the fact that this is specifically about the dropdown, then I'll reopen it if it is desirable to be fixed. However, my suggestion that instead of fixing it, we remove the dropdown entirely. There's no reason for a moderator or admin to be able to create a topic and instantly sticky it to a forum or view when it's only saving them one extra click, and when we have this sort of confusion over what constitutes "sticky" in various differing forums and views. Simplify it, and just remove the dropdown. Support Theme: Remove "Topic Type" dropdown from the topic form. Given that plugin or theme stickies are handled differently from regular topics, there's no need for a moderator or admin to be able to create a topic and instantly sticky it to a forum or view when it's only saving them one extra click.